While listening to Lamond's Beethoven sonatas, it strikes me how "eccentric" his and Schnabel's interpretations are compared to most modern performers. Both seem to have more expressive rubato and take more dynamic liberties than what I'm used to hearing from pianists of the latter half of the 20th Century. It's quite interesting to hear this interpretive "evolution". 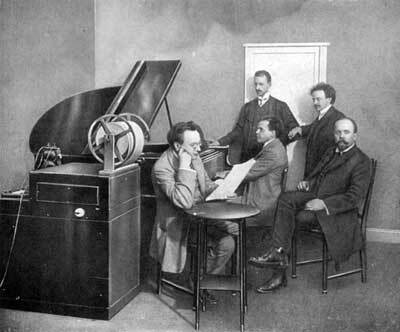 Here's a recording of Lamond talking about his meeting with Franz Liszt. Apparently the first thing they studied together was B. 's "Hammerklavier" Sonata Op. 106. No shortage of self-confidence there! Pt 1-3: Piano Sonata #14 In C#m, Op.27/2, "Moonlight"
Pt 4-5: Piano Sonata #23 In Fm, Op.57, "Appassionata"
Pt 6-8: Piano Sonata #8 In Cm, Op.13, "Pathétique"
Pt 9-11: Piano Sonata #17 In Dm, Op.31/2, "Tempest"
Pt 13-16: Piano Concerto 5 in Eb major, Op.73 "Emperor"
Thanks, Ed, for this enlightening post about a fairly forgotten great "Beethoven pianist". Even though the Beethoven kiss on Liszt's forehead might not have happened, a more solid link in the chain from Beethoven to Lamond is the fact that Carl Czerny was Liszt's only piano teacher---and he was a pupil and great admirer of Beethoven(as well as the first pianist to publicly perform B's 5th piano cto.). Czerny incorporated many of B's piano techniques into his own teaching method--passing them on to Liszt, who in turn passed them on to Lamond. Yeah I agree - I do wonder what B would have thought about Czerny's etudes for learning piano? B kept threatening to make his own instructional book ("something quite different") - now that would've been something..
Gwen - which are the study pieces? Are they WoO/Hess listed?